They got me! Those darn kids did it! I’m such a sucker! For the last 5 nights, I’ve seen sparkle, delight and innate wild enthusiasm from the kids of our church’s Vacation Bible School. Actually, I didn’t see it, Daniel did. I agreed to play Daniel (of the Lion’s Den fame) in a series of skits for VBS. It was a week’s worth of story-line, 4 shows a night. I shared the ‘palace’ (stage) with our Pastor Tim Soule, as the over-the-top, comic-relief, high chief of staff, Ashpenaz. It truly was the highlight of my day to interact and enjoy the responses of our little friends. Hugs and Hugs and High Fives! I am no great actor (Pastor Tim, IS!) and yet the grip that the plays had on our little friends was amazing! They could see that I was just Aaron, and that we were in a regular room in the church. Our costumes were basic, we barely rehearsed. We couldn’t hide the big TV screen that we used to show the script (so we didn’t have to memorize). Sometimes the ‘surprise’ entrance was foiled by sharp eyes looking out the crack in the door. Not everything was perfect, in fact far from it. Yet the 80 or so 4-9 year olds, let this world of the Palace and Ashpenaz and Daniel and Prayer and Lions and the Love of God completely engulf their reality for the 18 minutes (or more) that they were with us. So when do we switch? When do we lose that? I first heard from Dr. Wayne Dyer that the word ‘enthusiasm’ has roots in the Greek version of éntheos which means, ‘having God within’. Wow. That is EXACTLY what I saw all week long in these little kiddos. They were Full of God! They were rich in Spirit! They overflowed with ‘Entheos-iasm’!! One night, a little girl, flat out guffawed at almost ANYTHING that was said. She just cackle-laughed and cracked up at everything! She also hugged me every time she left. On the night of loneliness, they were somber, and honest, and almost everyone admitted to having lonely feelings, in front of their friends, out loud, with sincere hearts. Sometimes they had serious questions about the story they just couldn’t hold in. They shouted out, they got involved, they cared. We even heard a little guy ask “Is this really real?”, as Daniel was hauled off. Wow. That’s Right. At some point in our young little lives, we all were full of this energy, this spirit, this all-in-ness. It’s so contagious that I’ve been ecstatic about the experience all week long. I’m stating a FACT, that it’s Bad. It’s Sad. It’s what keeps us stuck. It causes our problems, it doesn’t keep us safe from risk, or from truths or the realities of the world. Our pride in our own ability to foresee problems and play it safe, or be conservative, just gives us a stagnant life of living in the bleachers. These kids showed they hadn’t flipped that switch yet. They were all-out, all-in. Even as the audience of our plays, they were living in it with us. They couldn’t help but be right in the middle of the action, on the court, they bought-in, they went there, fully present, alive! So they got to go on a fantastic ride for the whole week. Every kid had an adventure this week, right in our midst, right in our ‘normal world.’ They know how to rise up. They still remember, even subconsciously, that God has created a vibrant world of possibility, that we can choose to see, or choose to not see. So! Has your Sad Switch been flipped? I remember mine flipping somewhere around 5th grade. The rules seemed to change. I felt something shift. It seemed like letting go of ‘kid’s stuff’ and becoming more grown-up, was a good thing… Oops. Now that I saw our more raw form grouped up and screaming, wildly laughing, and sincerely hugging Daniel on their way out the door. I’m elated to share with you that I’ll be letting that switch more easily flip back. My tight grip on fitting-in or living properly, is… well… actually… I already wore it out a couple years ago… Now I know it’s true value. Homework: Wonder and delight about something small. There is something right now, that you can see with your eyes, yet you know is too amazing to explain. Maybe a picture of a cute little nephew, or the astounding technology that allows you to connect with people around the world, or maybe, just maybe (if you flip that Sad Switch back to original position), you can see your own self as ASTONISHING, as Beautiful, as a divine child of the one true God. You can be entheos-iastic, about YOU! PS – Awesome THANK YOU to Debbie Soule for inviting me to play this role – She’s had a profound impact me. She’s seen a wider scope of my abilities, than I ever could have. Bike Riding Lizard! Click Here! Do I let my Lizard ride my bicycle? Sure Do. Sometimes it’s even a good thing. 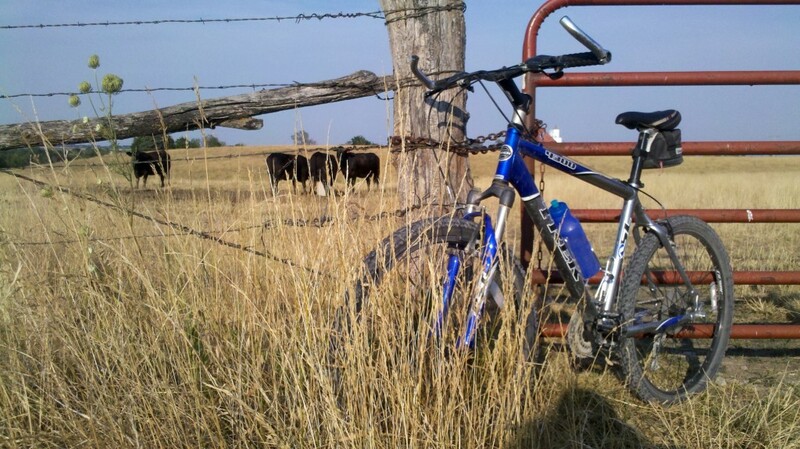 So last Friday evening, I decided to pedal around for awhile and went on a cruise south, down the rail-trail to Richmond, KS and meandered back through the country roads home. I had one of my favorite teachers, coaches and mentors speaking thru my headphones. The low, monotone, intentionally slow pace of Steve Chandler’s voice fits well with the shoosh-shoosh and crinkle-pop-pop sounds of a mountain bike lazily crunching down a gravel road. In this lesson he explained, the concept of our ‘Lizard Brain’ and how much too often, we use the most primitive reactionary survival-mode part of our grey-matter to operate from. When this part of our brain is in control, we are instinctive, we are defensive. We instantly judge, we see Good or Bad, and then act accordingly. It’s ‘fight or flight’ throughout our entire day or week, or whole life.We are living primitively, like a Lizard. Uh-Oh… I resemble that remark!! See, the other parts of our Creative, Compassionate and Enlightened Brain can operate in a profoundly beautiful and artistic fashion! We Humans have much more to use than the mere Lizard, although we must build this muscle and exercise it intentionally, to get the most from it. So obviously, this message was hitting home with me, as I saw the places where I was operating through a reactionary mode, rather than a creative mode of possibility. Creating is something a Lizard does not do. Sooooo, Anyway, back to the bicycling!! That night, I enjoyed the ride, it was a couple good hours of dusty pedaling and just being among nature. Thanks be to God! I enjoyed it so much, that I encouraged Lindsay to join me on a similar trip early Monday morning. I was delighted when she agreed. We were almost a mile outside of Richmond when I had a big ‘OH CRAP’ moment!! I had drifted a little too far to the left at the trail’s edge and the pea-gravel was real soft. My skinny front tire had found a patch of sandy fluff and that wasn’t gooooooood! The bars jerked hard right! My momentum was headed groundward! Careening down, angling across the trail I was yanking my right foot, trying to release it from the shoe-pedal-locking system. I clearly remember thinking that I must get my foot free, so that I could catch myself before hitting the dirt. But it took one failed try, then two failed tries, finally on the third I twisted harder, or just pulled with enough force to pop the shoe free from the pedal. I was able to stop the fall of the bike and slow myself down at the same time. I was breathing heavy and that pit in my stomach radiated a weird heat that washes all over, whenever a close-call happens. But the bike and I were perfectly fine. That close call only took a couple seconds, but to me, I can remember lots of clear detail, tiny moment by tiny moment. Guess which brain was in charge right then?? Thank God Too! I did need that most primitive mode to fire up and take over, to assess the situation and quickly act. Yanking and Jerking, thinking only of self-preservation, that saved me from a potentially severe crash. In the moments following, my more creative brain painted a picture of what could-have happened, and as I saw a bone sticking out of my imaginary busted arm, I was so glad to have saved myself from the fall. Remember when I said, I was careening across the trail?? Yeah, that was right across the path of dearest Lindsay! Thinking back, I do remember a flash of her passing right in front of my eyes, just before I got the bike under control! Crap Again! She had to speed up to go around me, otherwise we’d have had a tangled-mangled mess of bikes, sprockets, chains and (possibly bloody) soft tissue! It came through the air, from my beautiful finance, and it did not make me feel loved and supported in that moment. We pedaled on in silence for awhile, while my heartrate slowly dropped and I realized it was all okay. We were two fully functioning Lizards in that moment. Mine saved me from a crash, Hers responded by saving her from being crashed into. It took me awhile to explain to Lindsay that it hurt me, when she wasn’t concerned that I’d almost had to use my right arm to catch my fall, which wouldn’t have felt good at all. And I did have to acknowledge, that I could’ve been aware and understood, her shock, when I was pointed straight at her. Also, she then explained something quite profound. She told me that in the moment of my near-crash, she didn’t see that I was panicking. She explained that it looked quite slow and graceful. Maybe deliberate. She thought I was goofing around, and just messing with her. But that’s the Lizard at work. I was only focused on getting my foot loose. No time to scream, no time to explain. I was all business, and no outward communication. How often are we crossing paths with someone who seems to be all right, and doing fine. They may be jacking with our momentum. It may seem they’re toying with us or deliberately trying to mess with us. We may not even know that inside, they are fighting for survival itself. It rarely ever, has anything to do with us. How they are acting is about them. Our reaction is about us. And, how are we reacting in that moment? I know I’ve taken a few of your valuable minutes to tell this little story, but I believe it’s important to notice this Lizard brain at work. We do get to ask ourselves, anytime we’re not in a life or death situation, how we’d like to create our future. What the next step is that we’d love to take. How we can best serve our fellow man. We have more options, than just a gut-level reaction to a problem. After Monday’s bike ride, I do have a BIG appreciation for the times we’re able to instantly find strength and focus to get us through a possible crash. Did you know that Tomatoes are Procrastinators? Actually it’s the plants, not the fruit itself. Several times in the last couple weeks, I’ve gotten questions and compliments on the… uh… size, of my Tow-Maders from my friendly Princeton neighbors. Last week at the Brand’n Iron, I was questioned about the large fruits that were growing in my garden. The guys that asked, had driven by my place several times. They noticed the tomatoes and wanted to know how I was growing some large ones. Apparently, their gardens hadn’t produced fruit that size yet. “Are you using a special fertilizer?”, they asked? “Well Guys, I don’t know.” I responded truthfully. I really didn’t know why. Well, there we found a difference. Do you know what a Sucker on a tomato plant is? Well last year in my first gardening experience, I didn’t know, didn’t care, I just put plants in the ground, slapped a cage around ’em and let them go. The plants grew big and healthy. They turned into monsters. 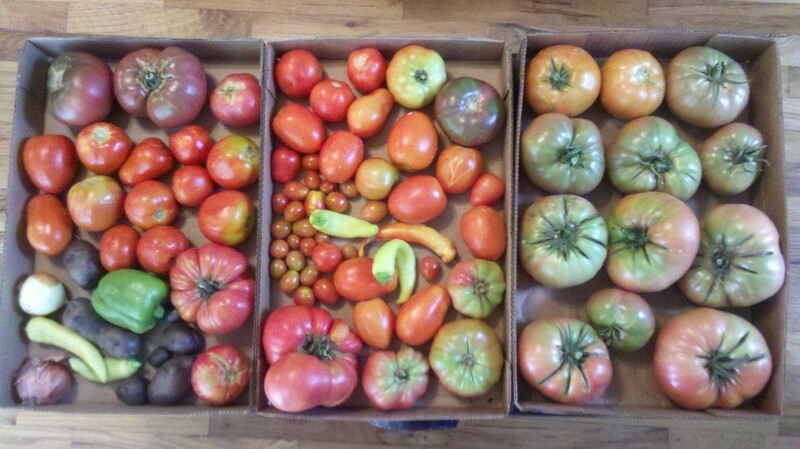 They packed the cage full of green-ness and I expected big results, lots of big tomatoes. This year, in planning my garden and watching lots of YouTube and Victory Garden, I learned about cutting off the Suckers, and decided to try it. A Tomato Plant is a vine. It wants to climb, and crawl and that’s why people cage them up, or tie them up. It starts at the ground with one main trunk of the vine then grows and grows. But almost immediately, it wants to do more than that. It wants to spread out. Following the main vine up, you will find a branch of leaves, and another branch of leaves, then maybe a branch of fruit. But in the elbows, the crooks and connections of these branches, pop out another type of branch: The Sucker. Right in that elbow, a couple small leaves sprout. Then they shoot out on the end of a longer stem. Then they sprout a couple branches. This is how the plant PROCRASTINATES. See, these Suckers, are actually another entire Vine. They are a whole complete tomato plant in themselves. They will produce fruit, but only after they have made a complete stem, many branches of leaves and flowered. This Sucker can grow in length two to three feet, before it ever produces anything. So imagine the main vine, if left alone, will produce it’s own leaves and fruiting branches, and TONS of suckers. They then produce their own leaf branches, several feet worth, for each. Having lots of green and not lots of tomatoes is the experience I had last year, with leaving the Suckers unchecked. Just like my own life; I tend to allow entirely new projects and distractions and time wasters to grow all over my schedule. I see how these Suckers look attractive and helpful, because they’re so green and vibrant and full of possibility. I can imagine (unrealistically) that having big fruits hanging all over the main vine, AND all the Suckers seems more appealing than just the original plant. Truth is, to get more fruit this year, in my garden, I cut the Suckers. I made an overall plan to chop them off whenever I saw them. They are easiest to break off when very small. It takes more guts to cut them off, when they’ve gotten bigger. Some have even been missed until they produce fruit, but I cut ’em off anyway. 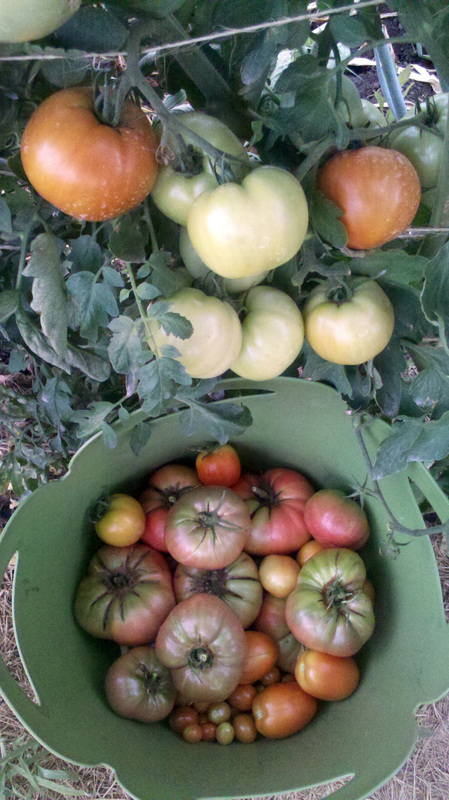 And the results for me are: I am pulling Big Healthy Tomatoes off the plants every day. And they’re noticeable enough from the road, that I’ve been asked about them. Actually, it would be a lie to say that my plants don’t have any suckers on them at all. A few of these branches grew huge and fast, and were hard to distinguish from the main plant. 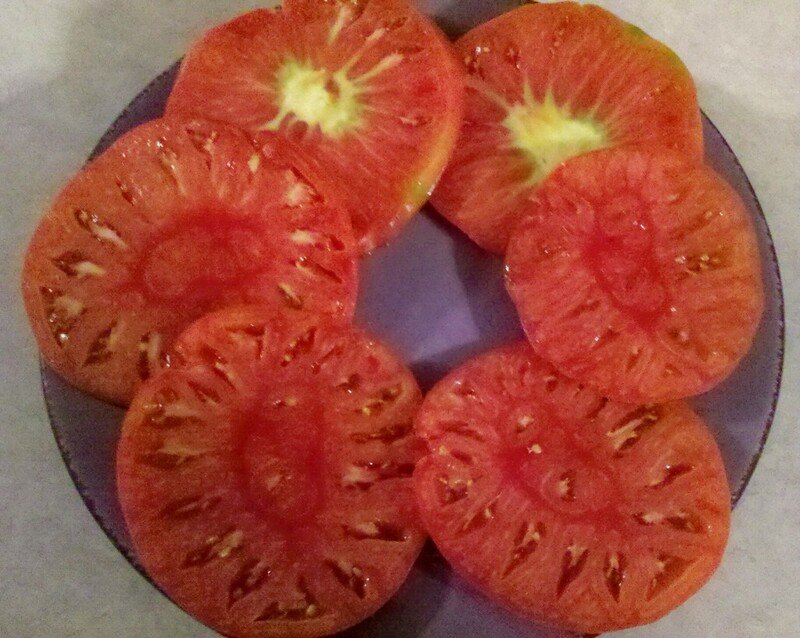 Sometimes the vine forked evenly, so it was difficult to tell which was the Sucker. Overall, a few of them is no big deal. Why is it bad to leave them all unchecked? Well, there’s one more aspect. The Suckers, when growing, produce more Suckers! Yeah, It’s exponetial! The roots of these plants are strong. The main vine and plant are amazing. But they are only so big, they only can soak up so much water and nutrient from the ground. The main vine doesn’t grow in capacity with each Sucker that now wants it’s own supply. So how could we expect the plant, or ourselves to branch out, and branch out and branch out, and still produce big, high quality fruit? This is the distinction between Busyness vs. Effectiveness. The effective plant, is trimmed. It’s efficiently providing resources to a smaller number of blossoms, but it has so much more to give them. These blossoms grow and grow. Really, it was nothing I added. It was a matter of cutting away the unnecessary Suckers. The Sucker’ing ability can be a lifesaver in some instances. In a hard wind, a couple of my plants broke, and the growing tip of the main vine was killed off. Luckily the Suckers kept growing, and the plant recovered, but a little behind the others. They just hinder the productivity. 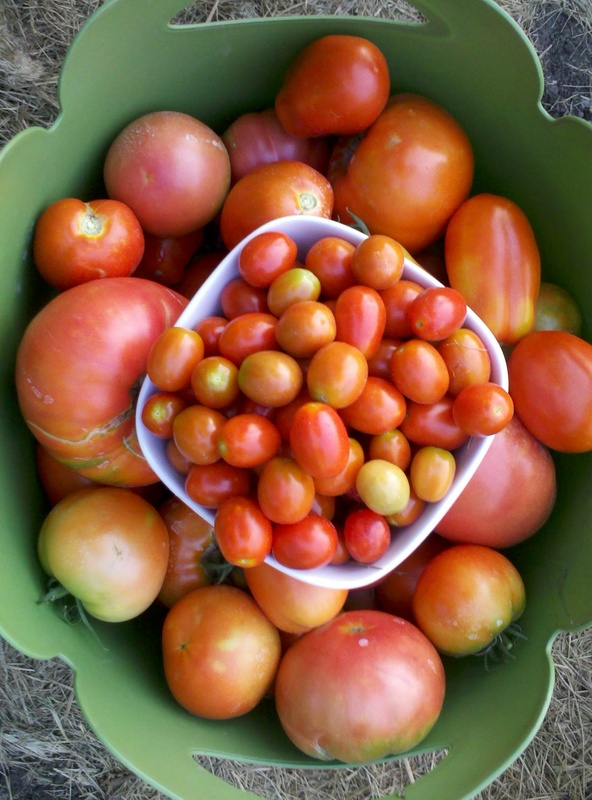 So, if you grow tomatoes, maybe you want to argue this whole post!! Be my guest. If you are really Busy, ask yourself: Am I producing great fruit? Am I Busy? Or am I Effective? If you are producing great fruit and you are being Effective, you can probably look back and see, where you trimmed the Time Suckers and Energy Draining elements from your life. Get Low, Get Low, Don’t Blow UP! So when your dash is lit up like a christmas tree, with twinkling lights blinking at you, silently screaming warnings of imminent vehicular death; and you’re just getting started on a two-thousand mile road-trip into the deep Rocky Mountains; what do You do? Just wondering, cause you’re about to read what I did in this situation last weekend while on vacation with Lindsay and Roxy and the Trooper. How do you prepare for a long roadtrip? Do you plan out each mile? Each night’s location to stay and all the points of interest you’d like to see along the way? Lindsay and I did that. We checked out maps, and ideas, looking at areas in Colorado we wanted to see. But, after she went to bed, many nights I wasted another 30 minutes (or more) staring at Craigslist, and pining away for rugged 4×4 SUV’s. As I’ve mentioned before, something excites me about having a locked and loaded fully capable off-road machine that can take you anywhere you want to go, paved road or no. I got a taste of this on my 6,000 mile roadtrip of 2010. I never ventured far off the highway, but would’ve loved to. Back then, the Trooper and Roxy and Cousin Nick and I drove all over the U.S. when that vehicle was still operating near peak condition. That trip was hard on it however, and since then it’s hinted at bigger issues. Like how the Transmission makes a funny jumping motion at certain speeds. Like how you can go online and read about Isuzu Trooper Transmission Nightmare, and read 20 pages of comments from owners of this car speaking their frustrations at trying to get this issue fixed. How it has cost owners thousands to try to nail down the problem. Like the sorta reasons that may want to spook you from taking a truck like this way out West and up the side of the Rocky Mountains. In my world, the transmission issue is just as real. I have worked on it with the help of friends and family, and it has kept on functioning almost normally for the last two years. So, although I pined away, clicking thru pages on Craigslist of 4runners, FJ’s, Landcruisers and Jeeps, It was all fantasy. I had the option of the old Trooper or no Colorado camping for us. We decided to take my truck, and take our chances. So some of my trip research included looking for new(er) tires, so that maybe we could drive on some backroads out there too. To explore beyond the paved. Purchasing new tires? That didn’t happen either. Okay, same ol Truck, same ol tires (street). At least I did get a couple yay-hoo farm-kids to look it over, give it an oil change and double-check important stuff like fluids and brakes. Loaded up with our snacks, a cooler, tent, bedding, clothes and a Dog, I can’t describe how excited I was to be headed West again that Wednesday morning. This is very far from home. This is not a fun light to look at while you’re on a roadtrip. That night in Denver, among cute kiddos and friends, we pulled the battery cables for awhile to reset things, although it didn’t work. The dash was dark again out on 285 leaving Denver, oh, for about 10 miles. That’s when things got steeper. We were driving up a mountain. This is tougher driving for any car’s ‘components’, but everyone seemed to zipping by, while my poor machine was struggling. My fears all came rushing back. Along with the dash lights too. And an A/T Fluid light and a yucky smell. Pulling off the road, into a gas station, I was not having fun anymore. Ahhh, what if this thing blows up before we even really get out of town? What if we have to get a tow, to some random garage? What if it costs waaay more than the car is worth? I just wanted to have a fun weekend in the mountains! So there went my mind. I was losing it. Yes, Lindsay and I had made agreements ahead of time, that if this happened, we had a backup plan. But I really didn’t want to have to go car shopping for a beater just to get us home, after we hadn’t even camped out one night! After a junky cup of coffee, and a break to let the car cool down, we tentatively headed back out on the road. This time, I decided to drive it differently. Instead of keeping up with traffic, I decided to drive my own pace. Instead of using cruise control, I decided to drive it manually, shifting it intentionally and (again) more slowly. So we adjusted our plans. We mentally shortened the length our drive. We were open to closer campsites than our original destination: Ouray, “The Switzerland of America”. And it seemed to be functioning fine actually. Longer and longer through day. Mile after mountainous mile, it kept on going, and not acting any worse for the wear. Although the menacing blinky lights nagged on. We had driven far enough even, that Ouray was looking like a possibility again. Of course we were a little behind schedule because of the slower speed, but not much. Really, it was only my anxiety about problems that were a problem. That night, at the rushing river’s edge, in the very deep bottom of the steep-sided Black Canyon of the Gunnison, I pulled the battery cables again. This time for the whole night. And we enjoyed our first campout. The next day, the dash lights were extinguished. Yay! And we climbed right up and out of that canyon, slowly, deliberately, and without issue. After a huge breakfast in Montrose, we made our way to Ouray. We enjoyed a challenging hike around the town, on the Perimeter Trail. Then Lindsay, Roxy and I had plenty of time to check out our first ever 4×4 backroad. We checked the book, the brochures and maps, we found one we liked, and headed up to Yankee Boy Basin. Up and out of town, the dirt road through the woods led us spiraling higher. Along narrow shelves, rocky overhangs, along streams and past mining towns, it became really fun. The road finally turned into a trail, and switching into 4-wheel drive, we roared up and over, we crept down and around. Rocks were obstacles, big drop-offs to the side, It was a BLAST! According to the literature, the trail got really tough at the top. So we stopped at Twin Falls, and looked around. I hobbled on aching knees from our hike. I enjoyed scenery not often experienced by the mass of tourists down in town. That night, in the hot tub at the KOA, we discussed our next move. We wanted to head back east, and there is a road through the mountains over to Lake City; the Alpine Loop. With the car problems we’d had, this is not the kinda place you want to have a breakdown. But hey, we’re adventurous. When driving around Ouray, you find plenty of reasons to think that you’ll need a jacked-up rock-crawler rolling on 35’s to drive off-road here… It seems everyone in town has a Jeep, and those that don’t, drive FJ Cruisers that cost as much at 5 or 6 of my cars, at least. So that next morning, we asked the friendly KOA staff about our idea to take the Alpine Loop to Lake City. The manager, David, and a couple locals were very helpful. First, I brought to them our plan. Then pointed over to our car. I started to say that I didn’t have a lifted truck with gnarly tires or rock sliders, and he stopped me. This was after he’d recommended we take Engineer Road. A road that all the literature said was too hard for stock vehicles. How fun is THAT!! Getting this advice from these local experts, I was fortified with confidence! We left Ouray that morning with excitement for the day ahead. As we pulled off the highway 550, and into a small lot at the base of Engineer Road, I was laughing inside. I remember passing this place two years ago. Thinking I’d come back someday with a Big Badd 4×4 ready to tackle the mountain, and here I was with the Troop. Two kids on dirtbikes took off in front of us. I pulled the front end up to what seemed like a too steep ramp full of boulders, the smallest of which where soccer ball size. With the knowing that our recommendation came from a trusted source, we locked it into 4-Lo and climbed. Smooth bounces, cracking rocks, hood and pines and sky. At barely 2000 rpm, the motor just chugged us up that ‘road’. Yes, it was rough. Heck yes! Only a few switchbacks in, and Linds had to get out to guide me through tricky spots. At one point, I’d picked too wide a line, and had to back up, to the edge of the cliff, to repoint myself over a massive boulder-top that I’d tried to go around. I’m telling you, THIS is Livin!! Several times through the day, people in lifted four-door rental Jeeps came up behind us. We were moving slower, and let them pass. They were less carefully rolling over the rocks, they were Stompin’ at a higher speed of crawl. But, I was proud that we didn’t see another stock vehicle on that road all day long. If it weren’t for the advice from the guys at camp, we’d have never dared to try this road. After we made it into “The Loop”, we passed Mineral Point, and took a side-road, actually a trail, probably an ATV Trail, that had me really puckered up at times. When we dropped into the descending switchbacks, with half a car length to make the turn, I saw the next obstacle was a two foot straight drop. The scraping didn’t hurt a thing, but did add to the drama of the moment. We eventually made it up and over Cinnamon Pass. Out on the blacktop again, we drove south through Creede and along the Rio Grande. That night we stayed at Great Sand Dunes National Park. Another 11 long hours in the car the next day, and we all three made it home with tons of vivid memories, and a hankerin’ to get back out there soon. The dash lights never did blink again like they had. The car never gave us trouble even with the abuse we put it through in the mountains. We’d learned to drive it, the way it needed to be driven. So what’s the point of all this?? I’ve had plenty of times in life where the dash lights are blinking. Times where I’m seeing all the negatives in my mind of what could happen. I know we all live in fear of the ‘what-if’s’ at some point. Just like life, in order to move forward, we didn’t have any option in the moment, but to slow down. To adjust our expectations. To get deliberate and intentional, and kick off the cruise control. When we do this, we may find out, not only that we’re going to make it along okay, but that we’ll find our true fit, our true specialty and calling. When we intersect the point in the road that our skills shine, and we leave the 99.9% of the world behind, it’s a Fantastic feeling. I hope today, for you, that you find something to slow down for. Something important enough to you, to shift into low gear and climb up and over and through. I promise, when you do, the view will be spectacular! Whine, Whine, Whine WHIIIIIIIIIIIIIIINE, Whine, Whine… and more Whining, and more!! Guess who; on our recent roadtrip, did TONS! of Whining!?!?! Okay, not just me, but Yes, Roxy the Black Dogg!! Dang Girl just wouldn’t Shut Up!!! This constant noise pollution coming from the back of the car really annoyed me last weekend! With my lovely finance Lindsay to talk to, I just didn’t enjoy Roxy’s two-cents as much as I had in my previous times in the car with the dog. We’d been on the road for three days, I’d tried everything to get Rox to calm down. I had stopped to let her pee. I had tossed her some snacks. We made sure she had fresh water and any other thing we could think of. She had everything she needed. She wasn’t hungry, or upset. In fact, there was nothing else I could do. She just kept on Whining! Finally, It occured to me, that if she was lacking nothing, maybe she was just Happy! Maybe, she was just Excited! Maybe, we could tell she was content because of this incessant high-pitched doggie-whine vocalizing. Her Whining meant she was Happy! Do you know any people like that? Anyway, after we discovered this perspective, it was much easier to deal with her noises. Instead of being frustrated and annoyed, Lindsay and I made it into a game. We’d talk to her in the back, praising her for her happiness when she was extra loud. We’d act concerned and worried when she’d quiet down. Overall, once we shifted our interpretation of her ‘complaints’ they just didn’t impact us the way they did before. I don’t know if she quit, or I eventually blocked them out, or that she just slept the whole way home, but it was a more peaceful ride. Does that help you in any way? ?